This “later” version of the old Portuguese pattern can be traced back to the 16th century when it was carried abroad by Spanish and Portuguese explorers. It was produced more recently by the Real Fabrica de Lisboa from c.1769 onwards and the pattern was manufactured elsewhere until the mid-19th century. It still has the ‘Dragon Aces’ which are now more like serpents, and the Maid of Clubs is about to hit a dog. The Maid of Coins holds what used to be a shield. The pattern was also made in Brazil, but a larger number of Belgian copies were produced in Turnhout until the early part of the 20th century, when the pattern died out. Above: 19th century Portuguese pattern, cards re-printed from original woodblocks, published by Vito Arienti, Edizioni del Solleone, 1978. 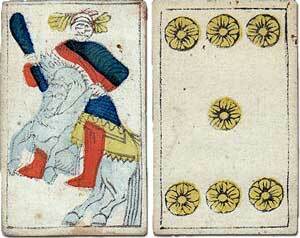 Similar to Spanish cards the courts are Sota (female page, no crown), Knight and King. There are no Queens! The Aces are dragons.